In an awesome effort from out amazingly effective contest we have passed 10 questions per day. See the great screenshot below! Now that we have passed this milestone, what do we do next? How do we use this to graduate? How do we maintain this level without a contest? Do we even want maintain this? 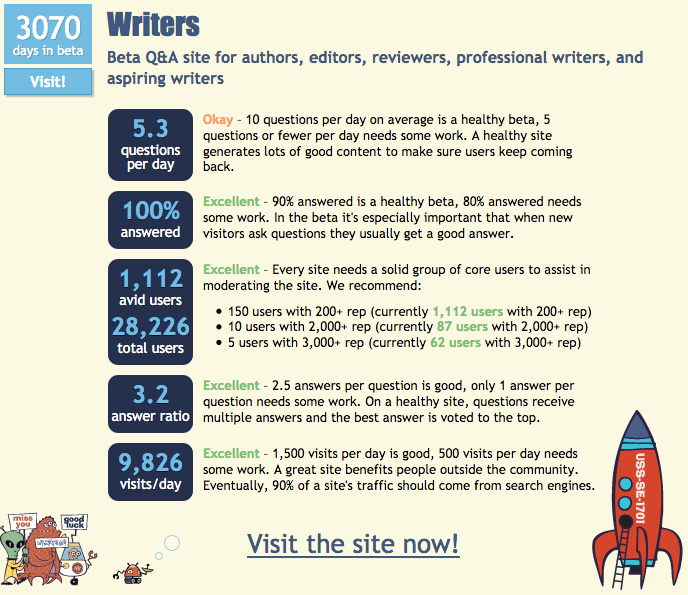 When a site starts to consistently receive 10 questions/day, we’ll consider it for graduation. I know many of you are frustrated with the lack of progress, but the new theme has really made progress possible for sites that have been waiting far too long in beta. After a short respite at the start of the new year, we are finally ready to help more sites achieve graduation. I'm also asking because I want the 5-questions badge. Not kidding. Answering is more my comfort zone, but the combination of rewards (badge + contest starting right when I discovered SE) is pushing me to consider questions*, too. This is ultimately helpful for me to switch from thinking of myself as a Writing Teacher (Engl100 and Engl393 - First Year Comp & Technical Communication) to more of a potential Writer. I think it is a dangerous approach when a group of users artificially raises the question per day rate by asking questions that they wouldn't naturally ask. Surely it is only a matter of time when you tire of making up questions that you don't need to be answered or when life events draw your attention away from this extra effort. Many extra efforts on many SE sites have burned themselves out after a few weeks or months, the Cogsci.SE Facebook page (which was created and died twice) is such an example. And this site has seen more users leave than are currently active on it, so I am not positive you'll all be around to keep the question rate high in the long term. But most of all, questions have to rise organically from the problems that the members of the community face in their writing, otherwise the quality of the questions diminishes. 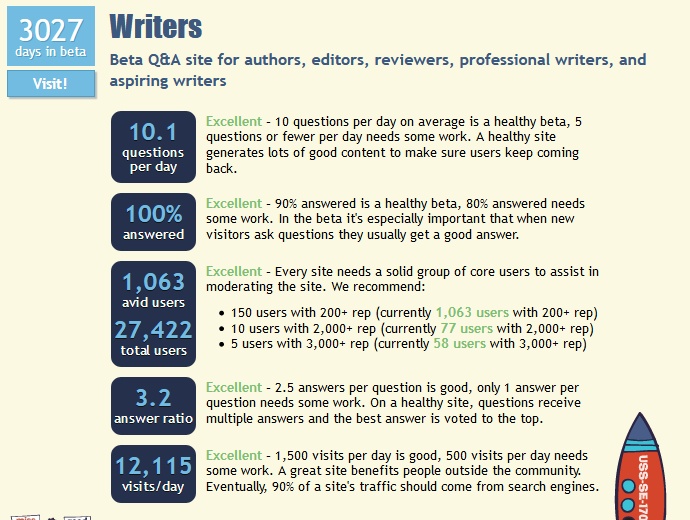 wait and see whether the question per day rate remains over 10 after those push-starting the site have stopped pushing. Not the answer you're looking for? Browse other questions tagged discussion site-promotion questions graduation . How would having the writing challenges on Meta work out?